Monday morning (26th June) was calm, bright and with a little mist. The wind and swell of the preceding two days had abated and now all was looking good for a quick scoot down the east coast, back to Dublin. Fair Head and shortly afterwards Torr Head mark the north-east corner and the start of the east coast. There are phenominal tide races, whirlpools and rips hereabouts as the tide squeezes between the nearby Scottish coast, Rathlin Island and the Irish mainland. I was taking no chances, so I timed my departure from Ballycastle to be at Fair Head at slack, when there would be little or no movement. With little wind too, all should be calm. Fair Head was easily reached and all was calm as expected, but there was some tide flowing south already and a clear eddy line visible a little way off shore. By the time I reached Torr Head, perhaps half an hour later, the tide was rushing past at easily 3kn creating some turbulence. In practice it was no big deal, just a point squeeze easily passed, but I wouldn’t like to be here later in the cycle or with adverse conditions! So that was it. Now I was heading south, back to Dublin, protected from the Atlantic swells and the prevailing westerly winds. I found a rocky beach for a quick pitstop just south of Torr Head. The coastline here is dominated by green mountains rolling down to a low rocky foreshore with small towns and villages set into the backs of relatively small bays. Carnlough is one such place which made a very pleasant lunch stop in a small harbour with shop, cafe and toilets all just there! With tide behind me and little wind, I wanted to make the most of it. I continued on past the industrial port of Larne, minding the ferry (in port) before eventually arriving at Portmuck, a tiny harbour with a sandy beach and grassy headland, 65km after departing Ballycastle that morning. There were a few houses, but it looked perfect for camping. I found out later that it wasn’t actually allowed but. since I had a small tent and would be gone by morning, nobody seemed to mind. I hadn’t been there long when Peter Edgar, another sea kayaker, walked up. Another happy coincidence! He brought me up to his parents nearby where I was plied with tea and cakes in front of the fire as my wet gear was rinsed and dried ready for the morning. Thanks very much! Crossing the shipping lane at Larne. The next morning wasn’t so attractive with a south-easterly headwind, drizzle and fog. It was a slow day in every sense if the word. I crawled across the 12km entrance to Belfast Lough on a compass bearing, unable to see land for most of the crossing, the monotony broken only briefly by the abrupt emergence from the murk of a Stena ferry, a few kilometres in front of me. Donaghadee, just south of Belfast Lough. Still foggy. After about an hour and a half, I was pleased to see land of about the right shape! I headed around the corner through the sound to Donaghadee. Nothing much happened in the sound – it was flat for a wide margin at the edge even though the tide hammers through here, squashed between the Copeland Islands and the mainland. I was now on the Ards peninsular, fairly flat with low rocky shoreline, sandy beaches and rock reefs extending well out to sea. There were some static caravan parks. After a while I got shouted at by a bloke with a white van standing some distance away on the shore. Strange ’round here. I gave him a wave and paddled on to Portavogie, passing some more beaches and caravans, aware that this might be the last good landing for a while. Easterly wind was forecast for the next day, so I wasn’t keen to risk getting stuck on a beach. At Portavogie I was delighted to be met by Brian Redpath, the bloke in the white van, also a sea kayaker, who’d contacted me a few months earlier and whose details I’d lost! Squalid launch at low water, Portavogie. Pleasure craft not permitted! Portavogie is a fishing port on industrial scale, with deep harbour walls and a film of oil / diesel over the water. The entrance is narrow with blind corners and little space to avoiding fishing boats on their way in or out. Whilst it’s an all-weather landing, it’s not a good spot for a kayak, indeed pleasure craft are not permitted in the harbour, so I was told the next morning! The departure at low water from the only usable slip was squalid with soft, thick, black greasy mud for several metres to get in and then an obstruction just under the water. The paddle south was a bumpy affair with the easterly wind. I’d barely got going when it slowly became clear that the “tall birds” ahead were in fact standing on a causeway stretching as far as I could see both left and right! I didn’t feel like paddling out to find the end of it, so I paddled up to it and found a short portage of only 10m. Thereafter, it was fairly easy going until Strangford. The entrance to Strangford Lough is another notoriously rough spot, largely because of the huge tidal flow into and out of the narrow channel connecting the lough to the sea. I timed my arrival for slack to make it as easy as possible, but it was still pretty lumpy with the east wind and that continued all the way along the cliffs to Ardglass. I was cold, tired and sore. I found a cafe by the marina in which to drip over a bowl of chowder. I had intended to continue to Newcastle, but quickly found out that what I had thought would be a good landing wasn’t actually so with easterly wind. Not having a better plan and seeing a nearby B&B, I decided it would be good to stop for the day. Burford Lodge B&B, pleasant, convenient and economical. Well, now the weather’s deteriorated further with gale force winds forecast today. They’re northerly, the right direction, but I can’t paddle in that! With luck I might get out tomorrow or Sunday. I have about 130km left to do, which ought to be 3 paddling days. But which days? I was on the North Mayo coast at Ballycastle, watching the waves, viewing the archaeology and eating more than once at the friendly local cafe, Mary’s Cottage Kitchen. Waiting for a break in the weather is hard work. I’m not very good at waiting. Eventually, after 3 days off the water, a small gap appeared in what looked liked it was to be a week of awful weather. It was another start just after dawn, this time to get the paddling done by early afternoon when the wind was due to pick up again. I had a couple of hours of light wind around the cliffs of Downpatrick Head and along to Killala Bay, my first stop. The cliffs are spectacular here with very flat layers visible and near vertical edges. There are a number of caves and stacks, not that I was going in any of them with the swell. 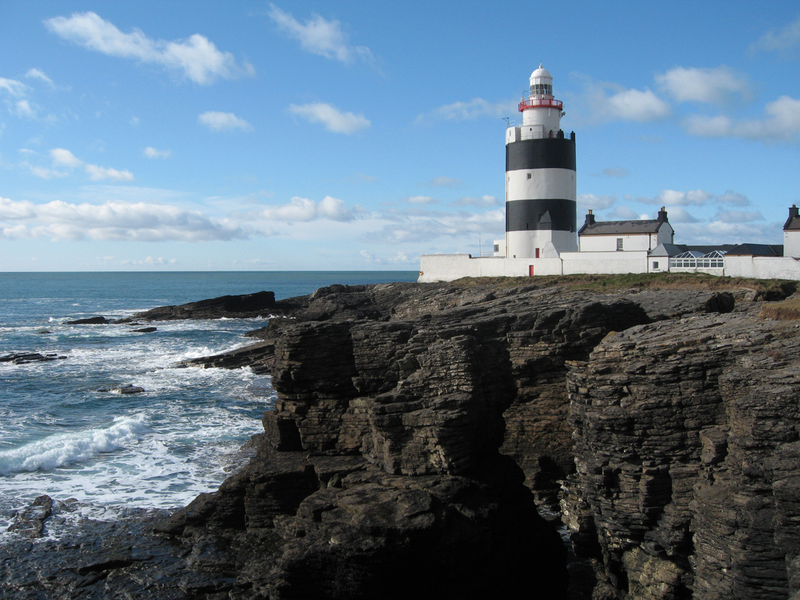 Killala is a wide bay with an open crossing at its mouth of around 10km. With the mist and low shoreline, the far side was rather indistinct. It should be due east according to the chart, but it felt a bit odd when I set off on an easterly bearing. Poor visibility is often confusing, so it’s best just to follow the compass. But hang on a minute, there’s a water tower over there which I really ought to be going a bit closer to. Funny. I fished out my hand compass to be sure to be sure. That read 14 degrees closer to where I was expecting! I found out later, when I unpacked, that the metal hanging loop on my wash bag had been right underneath the deck compass. Don’t do that. The shoreline was now low and broken with rock reefs extending on all the points. Easky, famous for reef-break surfing, was working nicely. I had thought to get out there at the slipway, but it’s not particularly well sheltered and with the surge up and across the slip I thought better of it. By now the wind had picked up considerably and was blowing hard, offshore. I had to paddle out for a kilometre at most of the points to avoid the numerous heavy breaks, easy enough to get out but hard work to get back in. My plans changed and I decided to stay close to the shore instead of crossing Sligo Bay north to begin a slow circuit around Donegal Bay. By the time I’d been blown out to Aughris Point I’d had enough for the day. I got in touch with friends Des and Sonja, formerly of Dublin. They weren’t quite as close as I’d guessed, but Sonja drove for over an hour to pick me up, whilst I had a bowl of soup and a pint in the pub! Donegal Bay is the widest of all around the Irish coastline, the shortest crossing a little over 40km at it’s mouth, stretching from the cliffs of North Mayo in the south to the cliffs of Slieve League, Donegal, on the north side. It’s completely exposed to atlantic swells from anywhere vaguely west. It’s also possible to paddle around the bay, but it’s twice the distance and not necessarily much easier because of the cliffs of Slieve League, avoided by direct crossing. I’d be needing some decent weather to get across directly, but unfortunately normal service had resumed. I had four days with Des and Sonja looking after me, whilst I enjoyed myself plumbing in some outside taps, cutting some of the grass and sinking paving slabs. Meanwhile Des fixed my boat, my trolley and found me a new cag. Thanks very much! When I finally got back on the water, I had a near perfect forecast, F3-4 southerly wind all day and little swell. Visibility could have been better, but I could see land somewhere all the way across and Slieve League appeared after a few hours. The crossing itself, from Aughris Point near Sligo to Malin Beg was straightforward, 43km in about 6 hours. The slip at Malin Beg is unbelieveably steep and a challenge with an empty boat, so I went on a but further to Malin More where the prospects were better. There I found waves breaking across the bottom of the slip and bits of metalwork sticking out of one edge, a product of the refurbishment works, but I was getting out anyway! Despite having already paddled nearly 50km I didn’t feel too bad, no doubt a result of the extended rest of the preceding days and Sonja’s attempts to put some weight on me. I’m eating teenager quantities but am convinced I’ve lost quite a lot of weight nonetheless. With northerly wind forecast the following day and a particularly exposed section of cliffs to follow, I decided to crack on, eventually hauling in to a remote slip at Loughros Head after 72km, my longest day yet. It was a lovely spot. The following days were a mixed bag, mostly warm and sunny, but unfortunately with a stiff headwind. Burtonport was the first stop and the collection point for my last package of maps, in The Lobster Pot. It was an excuse for a change from cheese and pickle sandwiches and an opportunity to post maps, charts and a leaky cag back to Robin in Dublin. That night I made it to Gola Island around 20km north of Burtonport and close to Bloody Foreland, where the coast turns north-east. Easy landing turned difficult launch the next morning at Gola. Paddling around the next day was very hard work into F4-5 wind with waves and spray in the face all day. Tory Island looked close, but there was no chance of doing that today. I’d hoped to get to Fanad Head, but with the wind and waves that wasn’t going to happen either. I eventually crawled around a rather rough Horn Head and then surfed in against the tide to Portnablahy (Dunfanaghy), well short of my target. With no obvious spot to camp, a no trespassing sign and no evidence of hostels or B&B I knocked on a door near the slip. A local skipper and estate agent called Charlie and his wife Mary kindly let me camp in their garden and fed me tea and toast in the morning! The next day (Weds 21st) was near calm and sunny. It wouldn’t last but it was perfect for passing the headlands, Melrose, Fanad, Dunaff and crossing the numerous sandy bays and lough entrances en-route to Malin Head. It was such a good day that I arrived at the start of the final 10km crossing to Malin Head about 2 hours earlier than would allow me to get around the head. By now it was a grey day, the wind had picked up a little from the north-west and small waves had replaced calm sea. I decided to cross to the pier on the south side of Malin Head whilst I still had the weather. Malin Head is a notorious spot with a relatively sharp, narrow head sticking out west from a long peninsular. There are rock reefs sticking out from all of the points, fast flowing tidal streams and all prone to swell. All of this creates very turbulent water in adverse conditions, the more so whilst the tide is flowing. I had to time my passage for “slack water”, the time around which the flow slows to a stop and then reverses direction. Then, not only is it possible to paddle, but the conditions should be calmest. After hanging around for a couple of hours at the pier, the allotted time arrived to paddle the few remaining kilometres to the point, to get there at slack. By now the wind had strengthened to F4 north westerly and there were white caps on the sea. It didn’t look good, but I decided to go for a look at the point anyway, just in case. It wasn’t good. There were breaking waves and white water all over the place with no easy route through. I went back to the pier and stayed at the hostel there. The forecast said the wind would drop overnight, so early morning, roughly 12 hours later, would be the next opportunity. I got up very early and started paddling at 6.40am. Sure enough there was only a light wind and the white caps were gone. It looked much better. When I got to the point it was still rather white there with waves crashing through the inside channels and breaking heavily over the reefs. Ordinarily I’d just paddle offshore to get around, but this extended for as far as I could see in the wrong direction. I hung around for a bit in case I was early for the tide and poked about a bit looking for an easy way. Eventually I saw what looked like a manageable route outside the worst of it. I went for it. It was a mess with steep cresting waves across my path for a kilometre and rough water caused by waves reflecting off the cliffs for a few more kilometres. After about half an hour in the washing machine I finally arrived at the calm of the pier on the north side of Malin Head. I was around and would now be increasingly protected from the atlantic swell as I travelled further east. The rest of the day seemed straightforward, a long paddle back down the north of the peninsular with a sleep on a beach for a few hours, waiting for the tide, and then a long crossing almost due east from Inishowen Head to Portrush. It was grey and drizzly again, but I had wind, wave and a lot of tide behind me so it was pretty much surfing for a couple of hours to complete the 17km crossing. It was late by the time I arrived at Portrush. I went into the yacht club bar dripping. They offered to put my boat in their store on the quayside and let me use their showers. I went up to the bar where Martin from Portrush surf school kindly bought me a pint and organised a bed in the Portrush Townhouse hostel. Very nice it was too! After fish and chips and attempting to plan, I fell into bed at midnight, 64km closer to home. Having been on the go for 5 days and travelling from near Sligo to Portrush, I didn’t feel like paddling on Friday. But I could see the wind coming and I wanted to be close to Fair Head, the start of the east coast, ready to get around at the first opportunity. It was a nice day with a good westerly, so I took the opportunity to paddle past the Giant’s Causeway and further east. There was too much swell to get close to anything, indeed too much swell to land anywhere on the way. And so now I’m in Ballycastle, this time on the Antrim coast, watching the waves and waiting for the wind to drop. Yesterday I walked the Giant’s Causeway and dropped into Ballintoy Harbour, where I chanced upon Robin Ruddock and a group of Causeway Coast Kayak Club paddlers. They welcomed me to their barbeque in the boathouse and Robin delivered me back to Ballycastle later. A splendid evening. So, now I’ve paddled 1330km from Dublin and have about 270km to complete the journey. Next up, the east coast.